Let us suppose it is our mission to produce electricity for a run-of-the-mill city with about 1 million inhabitants living by Western standards. This city will need about thousand megawatts of electricity, year round, in short 1GWye. In the visual, I compare four ways to accomplish this, along with the input and output of each of the options. For those who wonder: yes, I redrew the original scheme of Kirk Sorensen. I copied his info on the Liquid Fluoride Thorium Reactor and conventional nuclear, the Light Water Reactor. I added two options though: coal and the IMSR. Coal is what all nuclear options should be compared to. IMSR is LeBlanc’s Integral Molten Salt Reactor, which I think is Sorensen’s main competition in new nuclear. Let’s start with the lower two, coal and conventional nuclear. These are actually in use. Coal we have used since we started producing electricity. But how much coal will we need to accomplish our mission? That would be about 1,5 km of freight train, all wagons filled to the brim with coal. Oh yeah, that’s just for a single day. So for one year of electricity in our city, we will need 570 km of coal train: 3.3 million tons of coal in total. Of course, our coal powered plant does not only produce electricity, it also produces 9 million tons of CO2 and 330.000 tons of fly ash. This fly ash, roughly 57 kilometers of freight train full of it, contains all sorts of interesting heavy metals, like arsenic, beryllium, cadmium, mercury and…uranium! 5 (for Australian coal) to 60 (for Chinese coal) tons of it and about three times as much thorium. If we’d have burned German coal, there would be 43 tons of uranium and 130 tons of thorium in the fly ash. Interesting, since Germany has taken half of their nuclear power plants offline, and replaced them by plants using… coal. How much uranium or we going to need to accomplish our mission if we burn it in a conventional nuclear reactor? In a usual Light Water Reactor (LWR) we will first need to mine uranium ore, enough to make about 250 tons of natural uranium. Out of this we will produce about 35 tons of enriched uranium that we can use in our light water reactor. This will leave us with 215 tons of depleted uranium, with which we don’t really know what to do. An LWR can produce the required gigawattyear with 35 tons of enriched uranium. Basically, the LWR runs on the fissile component of uranium: U235. If it could run on pure 235, the math would be simple: 1 tonne of U235 equals 1 GWYe. However, the 235 is comes naturally with lots of U238. And although a small part of that will be used in the process, another part becomes transformed into unusable stuff. Plus it’s all mixed into one stuff we call spent nuclear fuel. This leaves us with an average of 35 tons of spent fuel per year. This can either be reprocessed, and new fuel can be made out of it. The picture however describes the U.S. practice, which is to not reprocess and store the spent fuel. It’s important to notice that the amount of waste is dwarfed in comparison to that of our coal plant. The third option is to use the fuel in a molten salt reactor that is based on the use of conventional reactor fuel, but then in liquid form. This is the concept of for instance Terrestrial Energy and Thorcon Power. Details of the fuel cycle have not yet been published. 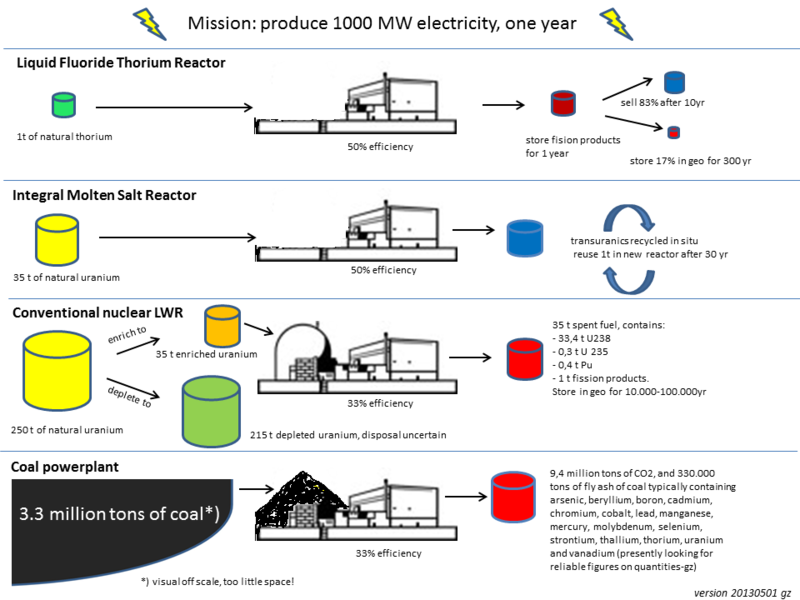 An earlier idea of Transatomic Power to run molten salt reactors on nuclear waste have been recalled early 2017. A small proportion is uranium salts, enough to sustain a fission reaction. In essence, this vessel reactor was tested in the 1960’s, it worked just fine for more than four years. In Sorensen’s design, the vessel is surrounded by a second one, called a blanket. The blanket is also filled with molten salts. This blanket has not yet been tested, but the principles have been, and besides they are pretty straightforward as well. In the blanket, thorium salt is present. The thorium catches neutrons that come from the core salts, and this, through several steps transform the thorium into uranium (U233). This uranium is purified out of the salt and introduced into the core where it, over time, completely fissions. Through this process, all of the thorium is used and the resulting uranium is completely burned.